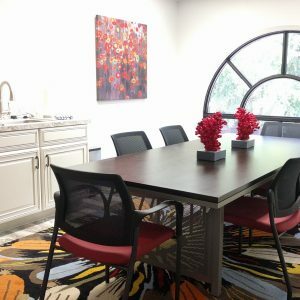 Completely freshened up, this office incubator has a clean and contemporary feel. A generic 70’s-era two story office building had been occupied by a real estate company – larger space upstairs, smaller singles downstairs. The property was purchased and plans were made to refurbish and paint this office as a business incubator for startups and freelancers. As this was an investment situation the new owners were quite interested in choosing a painting contractor with the capacity and discipline to get in and simply get the job done so that the property was ready to lease as scheduled. Crestwood Painting was chosen based on previous business done with this customer. Office doors were bland stained oak slabs with years of adhesive residue; interior windows showed dated and worn paint; walls had the usual old-age dings and door knob holes. The concrete floor had multiple layers of carpet adhesive, ceilings had yellow water spots and showed signs of texture delamination. We had worked with this customer before and so both parties had clear expectations going in. The new owners required a complete repaint as well as removing multiple layers of carpet adhesive from the existing concrete floor. Included were hole repair, thorough cleaning of adhesive residue on doors and window frames as well as skimming walls that had been faux painted. We were introduced to the general contractor, given a best-case timeline and, after a brief color consultation, we were ready to draw up a plan and get started. Fortunately, the color palette was all light, easy-to-cover gray tones so there was no concern about the extra time and cost involved with deep base colors. Carpet adhesive is often covered up because it can be hard-to-remove nasty sticky and gummy. Removing carpet adhesive is never pleasant but usually predictable – it hardens with age and so mechanical removal is the easiest, fastest and least costly option. (Many contractors still insist on using the more costly, slower, messier and nastier chemical removal – but there’s just no need.) In this case, the top three layers of carpet adhesive remained quite rubbery, which posed a challenge to the expected removal process. After consulting with the manufacturer of our floor machine we were advised to use different tooling; once the switch was made the the carpet adhesive was removed without having to resort to the slow and nasty chemical removal process. All carpet adhesive was removed to within 1/2″ of wall surfaces, leaving nothing but smooth concrete for the new floor installation. While there was very little concrete dust generated in this process, we made sure to have our industrial-sized HEPA vacuum connected at all times to protect our workers and minimize cleanup time. The property was scheduled to be in paint-ready condition by early January. 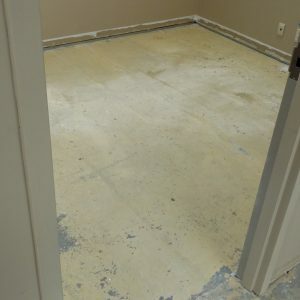 The general contractor was able to sequence his work so that we were able to get started removing the carpet adhesive from the floor over the Christmas / New Year’s break. The GC turned over the work space right on schedule and two weeks later we were able to turn it right back to the GC. Fully scheduled days and careful sequencing meant the whole project stayed on track. Newly painted break room is comfortable and inviting. Office walls – Sherwin Williams Super Paint, flat sheen. Often a satin sheen is chosen for offices but this owner preferred a flat sheen’s ability to “disguise” the bruises of commercial use. The other side of that argument is that a higher sheen (eggshell or satin) can be easier to clean. The downside? – higher sheen shows off wall surface irregularities much more readily. No right answer, just trade-offs to consider. Trim – Sherwin Williams ProClassic, semi-gloss sheen. Pro Classic now comes in a ultra-new “acrylic-alkyd enamel”. The short answer is that this is an oil-based finish delivered in a water-cleanable medium. For commercial offices this mean you’ll get a super-durable, cleanable finish that will last far longer than the standard, commercial-grade paint products that are commonly used in office environments. Office bathrooms – Sherwin Williams new epoxy paint – this has become the standard in commercial bathrooms. It’s a very hard, durable finish that holds up to harsh commercial cleaning products commonly used in office bathrooms. We even painted the metal bathroom stalls so the new colors carried across everything. The customer was delighted! First is a thorough cleaning – old wall-mounted file holders were removed and holes filled, adhesive residue and fingerprints were removed from doors. The entire area was dusted and then vacuumed to remove anything that doesn’t belong under durable new paint. Ceiling water spots were sealed to prevent the old stains bleeding through the new paint. Loose or delaminating ceiling texture was vacuumed off and new texture applied to match. A bright white ceiling paint was applied to give the whole area a clean and updated appearance. The trim was all sprayed – it leaves a thicker and more durable film of paint that is better suited to a commercial environment. Wood doors were primed (to better seal the surface and provide proper adhesion) and then top-coated. Metal window frames were a painted a complementary gray color that enhanced the door color. Walls were lightly sanded to remove “bumps and fuzzies” and then rolled with two coats of SuperPaint – an even finish with no roller marks. Custom-sized whiteboards take full advantage of large walls. Halfway through the project the customer asked about dry-erase white boards. 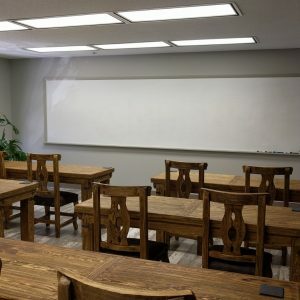 There are several options available and, after discussing pros and cons of each, they decided that the “on-wall” option allowed larger sizes at a more practical price point than the office-store or factory-made metal boards. After laying out the appropriate locations (5!) and sizes we sanded existing wall surfaces smooth, skimmed the affected areas to ensure a glass-smooth surface, sanded again and the sealed the surface in preparation for the dry-erase material. Dry-erase material is a thin and water clear product. Usually, the board surface is painted white for high contrast but it is possible to use an off-white color or even stripes, grids, etc. In this case, the customer asked their carpenter to install a wood trim border with a bottom ledge for markers and erasers. Good to know: erasers to technically work to remove markings however there is a slight residue left behind that builds over time and leads to the tell-tale “board haze”. Best to use a mild water-based cleaner (e.g. Simple Green) to completely remove any residue. The whole project came off smoothly – injury free, ahead of schedule, delighted customer and leasing at 10200 State Line Rd. is booming. 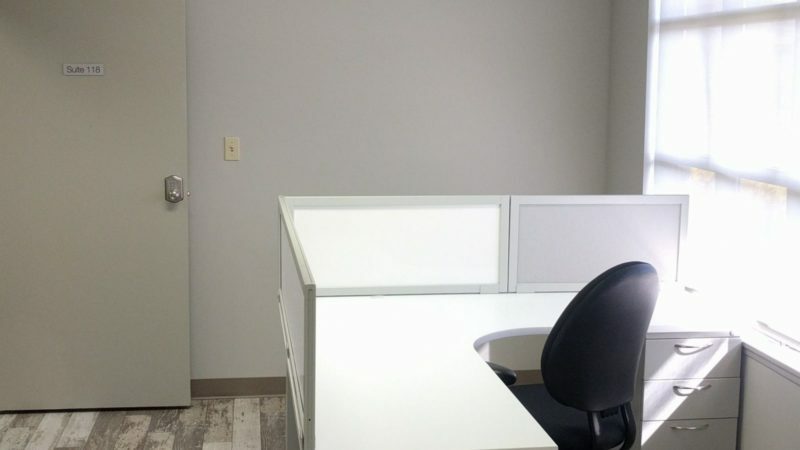 If you’ve got an office painting project in the metro Kansas City area, please call Crestwood Painting and let’s talk about some of the options.